Wreath Anniversary Card AND HorseSpirit Arts Gallery Announcement! When I make complicated stamped pieces, I make at least 2 of them (assembly line style), so I have an extra if I make a last minute mistake. This piece was left over from my mother’s birthday card in September. HorseSpirit Arts Gallery has been closed since the May 27, 2018 flood that devastated Old Ellicott City. Robin and Max have been searching high and low for a new location (not in Old Ellicott City – 2 devastating floods in 2 years makes it impossible to be located there again). They have signed a lease for a space at Historic Savage Mill. The grand reopening will be in November! I have a lot of work to do! I have been plugging away at card inventory for the gallery, but I am not quite at my goal yet. If some of my cards look familiar, keep in mind that I make at least 2 pieces of the complicated backgrounds. You may have seen the artwork before (and maybe it floated down Main Street into the Patapsco River on May 27th). Supplies: Stamps – Essentials by Ellen, Papertrey Ink, Stampin’ Up!, paper – Neenah Classic Crest Solar White, Stampin’ Up! Pear Pizzazz, inks – Hero Arts Fiesta Red, Fiesta Teal, Fiesta Yellow, Stampin’ Up! Pear Pizzazz, VersaFine Onyx Black, die – Simon Says Stamp, embossing powder – Filigree Fine Art Powder clear. 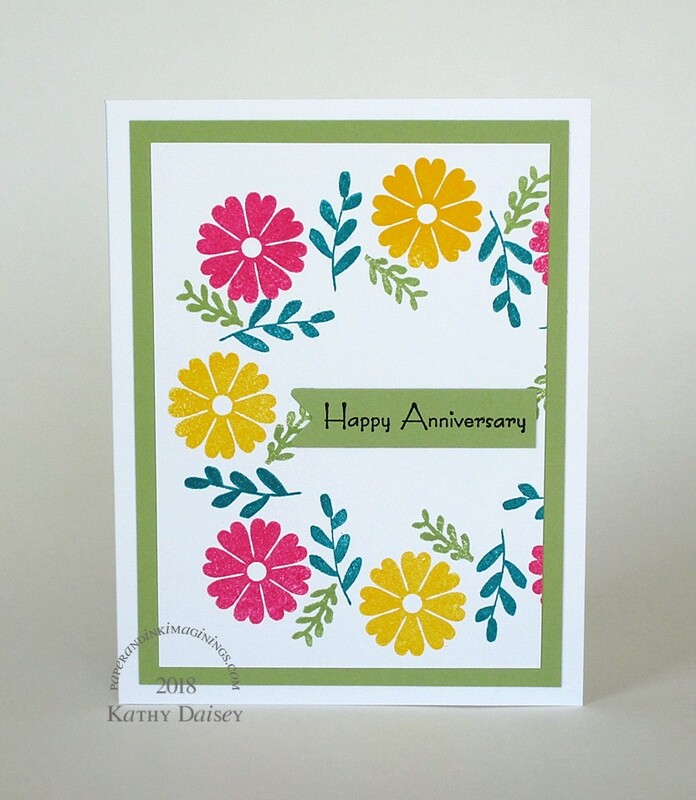 Categories: anniversary, card | Tags: card, Essentials by Ellen, Hero Arts, Neenah, Papertrey Ink, Simon Says Stamp, Stampin' Up!, Tsukineko, VersaFine | Permalink. I’m happy for your friends. I like how the wreath goes off the edge. Thanks, Terry! The background was square, I cropped it to fit onto a regular rectangle card.